NASHVILLE, Tenn.— Most churchgoers say the Bible commands them to give. But their tithes don’t always go in the offering plate. Half of Protestant churchgoers say their tithes can go to a Christian ministry rather than a church. A third say tithes can go to help an individual in need. And more than a few (18 percent) say tithes can even go a secular charity, according to a new study by Nashville-based LifeWay Research. 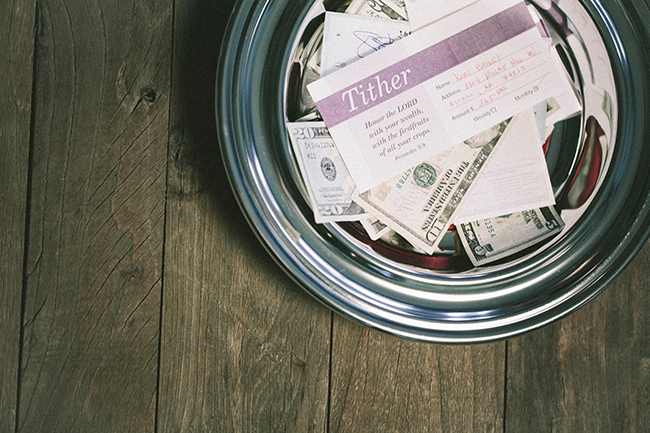 “For many churchgoers, tithing is just another term for generosity,” said Scott McConnell, executive director of LifeWay Research. For the study, LifeWay Research surveyed 1,010 Americans who attend services at a Protestant or nondenominational church at least once a month—as well as 1,000 Protestant senior pastors. Most churchgoers believe they are commanded to give. And many believe in the idea of tithing, which is often understood as giving away 10 percent of a person’s income. Eighty-three percent agree when asked, “Is tithing a biblical command that still applies today?” Eight percent say it is not. Ten percent aren’t sure. Most of those in the South (85 percent), as well as the Northeast (74 percent), say tithing applies today. So do African-American (87 percent) and white churchgoers (80 percent). More than half (54 percent) of churchgoers say they give at least 10 percent of their income to the church. That includes 37 percent who say they tithe and 17 percent who say they give more than 10 percent. One in 5 (20 percent) give regularly but less than 10 percent. A similar number (17 percent) say they try to give but aren’t always consistent. Eight percent say finances make it hard for them to give. Two percent do not give to their church. The more churchgoers attend services, the more likely they are to tithe. Fifty-seven percent of those who attend services at least once a week say they give at least a tithe. That drops to 28 percent for those who go once or twice a month. A third (35 percent) of those who attend once or twice a month say they are not consistent in giving—compared to 14 percent of those who attend at least once a week. Those who go one or two times a month are twice as likely to say finances make it hard to give (13 percent) than those who attend at least once a week (7 percent). Lutherans (55 percent) are most likely to say their tithe could include gifts to an individual in need. Nondenominational churchgoers (37 percent), a third of Assemblies of God/Pentecostal churchgoers, and Baptists (28 percent) are less likely to agree. So are churchgoers with evangelical beliefs (28 percent). Six in 10 churchgoers (62 percent) give to their church by check. That includes 59 percent who give a check at church—and 3 percent who mail one. Half say they give cash at church. Eleven percent give through their church website. Five percent give electronically through their bank. Three percent have automatic payments set up, while another 3 percent give using a church app. Some give through more than one method. There’s something about putting cash or a check in the offering plate that still appeals to churchgoers, said McConnell. “Giving is considered an act of worship—and clicking on a mouse may not feel as holy as putting your offering in the collection plate,” said McConnell. Seventy-two percent of pastors say tithing is “a biblical command that still applies today.” Twenty-five percent say it is not. Three percent are not sure. 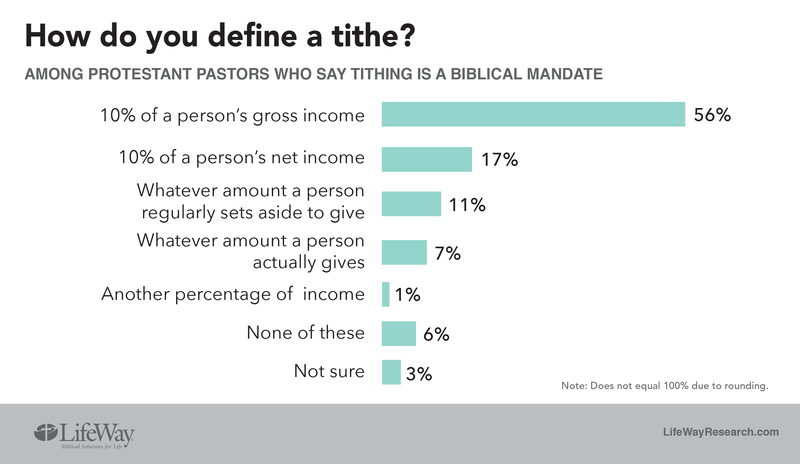 Of pastors who say tithing is still a biblical command, 73 percent define tithing as giving 10 percent of a person’s income. More than half (56 percent) say it should be 10 percent of a person’s gross income. Seventeen percent say it should be 10 percent of a person’s net income. Eleven percent say a tithe is whatever a person sets aside to give, while 7 percent say it is whatever the person actually gives. It’s surprising that fewer pastors (72 percent) believe tithing is a biblical command good today than churchgoers (83 percent.) It would be interesting to know why. Because tithing is tied to OT Law and is not a NT concept. Giving in the NT is to be from the heart and that may mean more or less than 10%. The OT tithe actually was 22-23% which included their tax.